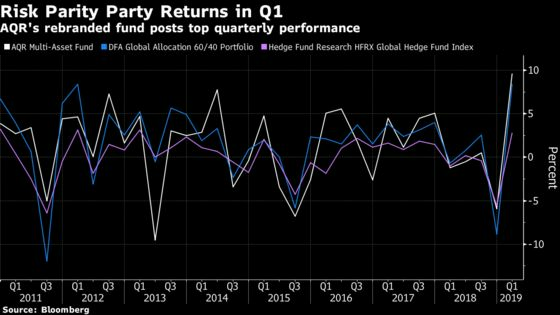 (Bloomberg) -- The “everything rally” that greeted investors to start 2019 delivered a record quarter for AQR Capital Management’s flagship fund. The firm’s AQR Multi-Asset Fund rose 9.6 percent in the first three months of the year, rebounding from a fourth-quarter drubbing. The fund, previously known as AQR Risk Parity, stripped the reference to the quantitative strategy last year. It lost about 6 percent in the fourth quarter and saw redemptions last year that contributed to a drop in the firm’s 2018 assets under management to $192.7 billion from $223.9 billion a year earlier. Risk parity strategies aim spread risk equally across different asset classes based on historical and expected volatilities in a bid to produce smoother returns. AQR helped popularize the approach to investing, which comes in many varieties and often entails a relatively elevated exposure to bonds. The Greenwich, Connecticut-based investment management firm’s record quarter came as the S&P 500 Index notched its best three-months in 10 years at the same time that bonds continued to surge amid a dovish turn by central banks around the world. Tweaks to the flagship fund’s strategy aimed to help it better navigate volatile markets. Two other AQR funds that retained the reference to risk parity in their names -- the moderate volatility and higher volatility offerings -- also booked their top quarterly performances since inception, with advances of 9.3 percent and 14.2 percent, respectively. These mutual funds all posted stronger returns than a strategy that uses a traditional 60/40 equity/bond asset mix as well as Hedge Fund Research’s global index. The strategy suffered during the cross-asset weakness in the final three months of 2018 -- and particularly in the first half of the fourth quarter, when stocks and bonds slumped in unison. Conversely, the positive correlation between fixed income and equities when both advance as they did in the last quarter helped to more than repair that damage. The multi-asset fund’s investment approach remains devoid of any reference to “risk parity.” The description notes that allocations are designed to provide “diversified risk-balanced exposures,” leaving the fund with a strategy that’s very similar in substance to its previous iteration.